The oldest known map of the area (see Map 1) is the 1695 “Survey of the King’s Lordship, or Manor of East Greenwich”, by Samuel Travers, the Royal Surveyor (which has north at the bottom), and shows that the area now known as the Westcombe Woodlands was on the northern edge of the Manor of West Comb – which stretched as far south as the road junction known today as the Royal Standard and was bounded by Greenwich Park to the west, with enclosed fields to the east, lying roughly where Westcombe Hill is today. Part of the Westcombe Woodlands (just north of the Westcombe Manor boundary) is marked on the 1695 map as “The gravel pits in which the King hath three acres or better”, and just to the east of this, another parcel of land is the “Broad Field, in which the King Hath a Rod of Land or more.” Local historian Neil Rhind argues that the “east side of much of Maze Hill was the site of gravel workings and lime burning pits” until the middle of the seventeenth Century, although it probably continued until the eighteenth century on the Westcombe Woodlands site itself. Gravel dug here was used as ballast for ships on long-distance voyages, as the docks and wharves of Greenwich were conveniently only a short distance away. The earliest Westcombe Manor House is thought to have been somewhere near the modern junction of Foyle Road and Westcombe Park Road. The estate was first owned by the Ballard family (who had it granted to them by Richard II in the fourteenth century), then by the Lambardes from 1552 until 1649, when the Lambardes (who were Royalist) had the estate sequestered by Parliament. It was then sold to Hugh Forth, a Mercer of London, who three years later sold it to Theophilus Biddulph, later made a Baronet. 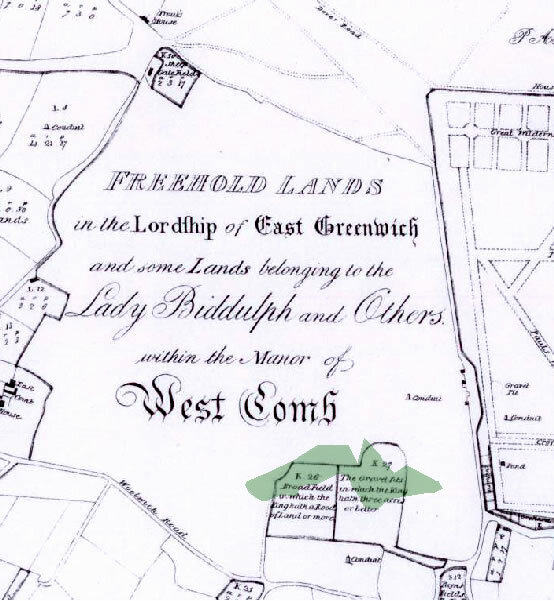 Sixty years after that, at the start of the eighteenth century, the Biddulphs sold the Westcombe estate to Sir Gregory Page, who already had a large estate across the Heath called Wricklemarsh. His mansion was built there in 1723. It lasted barely 65 years, to be pulled down in 1787 and the site and park land eventually laid out for building over the next 40 years, to create what is known today as the Cator Estate. The Paragon was one of the first developments, erected over the years 1794 and 1805. In 1725 Gregory Page granted a lease of about 40 acres of Westcombe Park to Captain Galfridus Walpole (brother of Sir Robert Walpole, who is generally regarded as the first Prime Minister of Great Britain). Galfridus died the following year. Henry Herbert, 9th Earl of Pembroke took over the lease and a substantial house, called Westcombe House, and was built by him in 1728. It stood on a site between today’s Humber Road and Coleraine Road. Marked now by Peachum Road it was demolished in 1854, twenty years before the railway was built a few hundred yards to the north. A view of the House painted by George Lambert from the west-southwest in about 1740 shows the surrounding area to the west of Westcombe House – now occupied by the eastern part of the Westcombe Woodlands and the houses of Foyle Road and Vanbrugh Hill – to be rolling parkland with groves of trees. At some point in the eighteenth century, a north-south roadway along the course of what is now Vanbrugh Hill (then called Love lane, Green Lane and Conduit Lane) began to be used, though no houses were built on it until the mid-nineteenth century and it seems to have functioned until then as a boundary between the parkland of Westcombe House to the east, and the gravel pits on what is now Westcombe Woodlands to the west. Until the eighteenth century, the area around the Westcombe Woodlands was entirely undeveloped – Greenwich was still just a small village. In 1695 it would have been possible to walk all the way from the gravel pits northwards to the river through fields, admiring the Queen Anne and King Charles blocks of the new Royal Hospital rising up out of the fields on your left (the rest of the ensemble, the King William and Queen Mary quarters, would not be built in the early eighteenth century). Vanbrugh Castle was built by its owner the playwright and architect, Sir John Vanbrugh, in 1719, along with a number of other buildings for his wider family on and around what is now Vanbrugh Fields and Westcombe Park Road.